and thier shiping is realy slow they dont stock them! now i bought these to kinda black out my stock chrome headlights alittle but still have quite a bit of light comen thru... WELL I THOUGHT!!!!!! i used thier CARBON FIBER style covers and thought those would alow lots of light thru them due to all the open clear holes... BUT i was very shocked that they block so much light! enough where driving at night with them with stock bulbs definatly isnt a good idea! if you use some covers i highly sugest upgrading to some nice headlight bulbs! or go with some true HIDs which is what ill be upgrading to preaty soon.... tho first ill be upgrading to some OEM fog lights! that should help out the light even more. so they might be good with all OEM unwrecked civics BUT i cannt be sure unfortunatly! BUT i must say the style is preaty nice and very easy to instal and take off if you wish very quickly! my only other dislike is they arent tight or velcrod on the sides or botom... so other than the top velcro and the tight hood fit they are loose. but that can be solved by just using some 3M double sided tape but its more of a perminant BUT SOLID mount... which is what im planing on doing. but next thing im gonna but is the HIDs after the fog lights. and i might just tint the headlights like i did my taillights. because that was like 3-4years ago.LOL if you want em tho ill sell em to ya. i still got em, minus the mounting velcro tabs things, and one of the tabs broke but it is hidden under the hood, some simple 3M double sided tape will mount em solid no problem! 25bucks takes em shipped in 48states. i just want em gone, they are just taking up space in my garage. 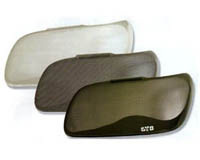 Quick Reply: 99 CIVIC GTS "headlight covers"